I made this card for Sharon's Friday challenge which was to make a flat card. Do you know how hard that is for me? My snowflake really needed to be popped up, but I played by the rules of the game with this card. I do have a little knot in the ribbon, but so does Sharon so I think I am ok. I started with a 5.5x11 white card stock, used my score it to make my folding line and ended up with a 5.5x5.5 card which fits nicely in a 6 inch square envelope. I adhered the snowman paper to it. 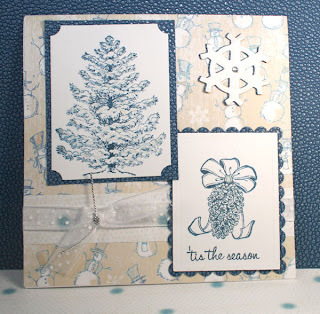 I stamped the images with Not Quite Navy from SU, cut out the pine cones with my Spellbinders rectangles die, and bordered both with a bubbled vinyl that for some reason reminded me of a snowy day. I used my Snowflake punch from Spellbinders and also shadowed it with the same vinyl for dimension. I felt my ribbon needed something under it, so I cut a piece of the polka dotted paper. It is hard to see on here, but does have blue dots on it. Beautiful card! Colors and textures are both perfect for snowflakes! Gorgeous flat card! It is difficult to make one that way! Especially if you're trying--LOL!!! Love your color choices here! Love the card and those colors are great! Oh, I am so bad, I still haven't got my card finished. I've got everything painted and need to put the finishing touches on it. I love your card, so beautiful and full of holiday spirit!